Special Policing Powers for Pakistan Rangers (Sindh): A Brewing Political or Constitutional Crisis? The development presents itself as an interesting anomaly in the Constitutional landscape of the country. The legal provisions under play here are Article 142 (Subject Matter of Federal and Provincial Laws), 147 (Powers of Provinces to Entrust Functions on the Federation), and 148 (Obligations of Provinces and Federation) of the Constitution, along with Section 4 of the Anti-Terrorism Act of 1997 (Calling in of armed forces and civil armed forces to prevent terrorism of civil powers), and article 11EEEE (Special Powers of Detainment and Formation of JIT) of the Anti-Terrorism (Amendment) Act, 2014. Is Article 147 of the Constitution2 relevant when it comes to granting special policing powers to Pakistan Rangers (Sindh) under the Anti-Terrorism Act of 1997, and as amended in 2014? Will the issue manifest itself again when the next deadline of the expiration of the special policing powers of the Rangers approaches? In a snapshot, the issue has seen numerous political vicissitudes during the past month. These came to the fore when the deadline for special policing powers granted to Rangers expired on December 06, 2015. The Sindh Government chose to approach the issue in a different manner, unlike in the past, by referring the matter to the Provincial Assembly of Sindh. This is the first time the Sindh Government took this stance since the start of the Karachi Operation in October 2013. Interestingly, Article 147 states that the concerned matter should be brought to the Provincial Assembly for ratification within 60 days. However, the Chief Minister gave approval for requisitioning of the Rangers in the Karachi Division on July 16, 2015, whereas the matter was brought in front of the Assembly with a delay on December 09, 2015. A summary was moved by the Sindh Government, extending Rangers’ powers in the province for another 60 days, however with curtailed powers and the requirement of the Chief Minister’s nod in particular domains. The Federal Government, however, rejected the summary, and restored complete policing powers to the Rangers stating that a Resolution of the Provincial Assembly could not amend a Federal law. Given that the PPP-led Sindh Government has made the decision to pursue the matter politically, rather than through legal channels, it may be construed that its position remains weak with regards to the issue. However, for the sake of the Karachi Operation, and the recent success it has achieved, it is hoped that the matter is de-politicized and the Federal and Provincial Government come to a consensus over it. It has become increasingly clear that especially in Sindh, criminality has often taken refuge in politics. Major Terrorists Attacks on Security Installations: Wither Accountability? All too often, when accountability and national security are mentioned together, there is a tendency in some quarters to deflect the serious questions. The questions themselves are alleged to be unpatriotic or anti-institution. Nothing could be further from the truth. Inquiries properly done-transparently, independently and in a non-partisan manner-can shed light on everything from policy failures to operational issues. Inquiries make reforms possible and can help prevent catastrophes from being repeated. Yet, the institutional aversion to accountability and transparency appears to dominate the true national interest here… A year on from the APS attack, precious few facts are publicly known, even though four individuals have already been executed after convictions in military courts for ties to the attack…. What went wrong? When failures, lapses and oversights are identified, institutions can be strengthened. When errors are covered up, future catastrophes become more likely. Since October 2009, at least 11 major attacks have taken place on major security installations, on which the inquiry report has never been made public; neither have those who were responsible held accountable publically. These attacks have included not only the one on the GHQ on October 10, 2009, but also on the PNS Mehran Base and the PAF’s Minhas Base at Kamra. This opacity permeates to such an extent that the Abbottabad Commission Report was leaked by Al-Jazeera and still has not been made public by the Government of Pakistan. Similarly, with regards to the Peshawar Tragedy of December 16, 2014, it has only been reported that 4 terrorists involved in the attack have been sentenced to death by the Military Courts, as informed by the ISPR. However, the security lapses that occurred have not been highlighted and neither has any accountability, apparently, been held in this regard. 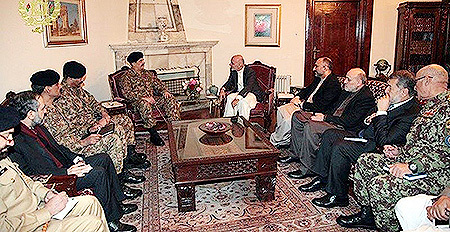 November 2015 saw a spate of competing public statements emanating from both the civil and military leadership regarding implementation of the National Action Plan (NAP).7 This highlighted that that there is hardly any fact-based discourse on the implementation of the NAP, primarily because there is no defined institutional mechanism to monitor its implementation. There is no question that a public statement by the ISPR commenting on the governance by the elected government is not the most desirable way of communication. Such public statements create the impression that perhaps the official channels of communication in our national security management are non-functional and, more seriously, as if the institutions lack coordination and unanimity. A cloak of opacity has also shrouded the deliverables and the progress achieved on them vis-à-vis the NAP. Only paltry figures, shared for a total of five times by the Prime Minister Office, constitute public reports on the implementation of the NAP detailing crackdown against hate speech, combing operations carried across Pakistan, number of executions, etc. Although Apex Committees were formed both at the Federal and Provincial level to monitor progress, they hardly serve as a replacement for constitutionally mandated institutions such as the Cabinet, the Parliament and the Parliamentary Committees. Although the Prime Minister and the COAS have met at least 73 times in the past 28 months, there appears to be a preference for informal, unstructured and un-institutionalized interaction, without any reliable mechanism for follow-up on decisions. No meeting of the National Security Committee (NSC), ‘the principal decision-making body on national security’, has been convened to discuss implementation of the NAP, with the last meeting held on October 10, 2014. The Parliament as well has shied away from playing an effective role in this regard. Although the Senate’s Committee on Defence has convened two meetings on Operation Zarb-e-Azb, not a single meeting has been convened on the National Action Plan (NAP). Similarly, the NA’s Standing Committee has also not convened a meeting on the NAP. Both the Standing Committee on Interior of the National Assembly and Pakistan Senate have also not convened a meeting on the National Action Plan. We believe that the two should develop a Plan of Action to critically engage in regular oversight of implementation status of the National Action Plan, Operation Zarb-e-Azb and the National Security Committee (NSC), which has not met for a year now, and, as was its mandate, not come up with a National Security Policy. An increasing international profile of the COAS, and persistent diplomatic efforts by the Military leadership to secure support for our fight against terrorism, have become a permanent feature of Pakistan’s foreign policy. However, these endeavors may be anomalous for civil-military protocols considering the COAS’ regular interaction with the heads of various states and foreign political leadership, in the absence of either the Federal Minister of Defence, or the Advisor to the Prime Minister on Foreign Affairs. COAS’ visited Turkey in October 2015, which saw him interacting with the Turkish President, Prime Minister, Foreign Minister and Defence Minister. The COAS not only took a trip to the Kingdom of Saudi Arabia, where he called upon Custodian of the Two Holy Mosques,Salman bin Abdul Aziz al Saud on November 04, 2015, but also to Brazil where he called upon the Defence Minister of Brazil on November 25, 2015 along with being awarded the Order of Merit by the Brazilian Government. 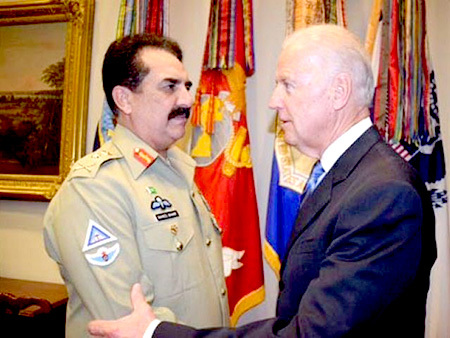 The COAS also undertook a trip to the United States from November 15-21, 2015..10 He not only held interactions on the Capitol Hill, but also called upon the Secretary of State, United States of America, Mr. John Kerry on November 18, 2015, and the American Vice President, Mr. Joe Biden on November 19, 2015. The COAS’ foreign engagements for the period under consideration ended with his visit to Kabul on December 27, 2015 where he met not only with the President of Afghanistan, Mr. Ashraf Ghani, but also the Chief Executive Officer, Dr. Abdullah Abdullah.